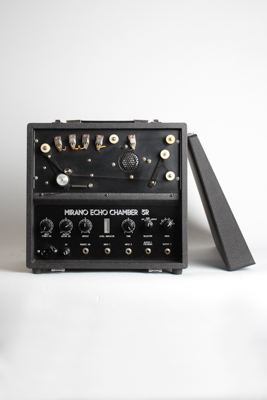 Mirano Echo Chamber 3R Model Echo Effect, c. 1960's, made in Japan, serial # 2C521, Black Tolex finish. Height is 13 5/8 in. (34.6 cm. ), 14 1/2 in. (36.8 cm.) width, and 9 1/8 in. (23.2 cm.) deep. Excellent + Condition.